Today, Roland is rightly revered for its analogue classics, but it shouldn't be forgotten that the company also contributed mightily to the rise of the sample-based ROMplers that would temporarily consign their crusty analogue synths to the trash heap. Indeed, though synthesists have been begging the company for decades to return to its analogue roots, the Roland’s flagship synths are still sample-based, with new variations trundling out of its factories with some regularity. It should come as no surprise that the company would choose such a path. Its classic analogue instruments may be beloved, but they didn't wear out any cash registers in their day. Consider the mighty Jupiter-8 - a legend, yes, but a mere 2000 of 'em were sold. The more successful Juno-106 managed to convince 40,000 customers to open their wallets, but its sales paled in comparison to that of the sample-based D-50, which sold five times that number. Similarly, the company rolled out 100,000 MT-32s, a barebones collection of multisampled instruments that would set the stage for later General MIDI boxes. 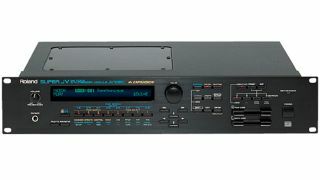 The D-50 and MT-32 were released in 1987. Limited by the technology of their day, they offered lo-fi samples with a slathering of grainy reverb to hide glaring 8-bit artefacts and egregious loop points. Still, they represented a refreshing change from the DCOs and DXs that dominated the era. Instant classics, the D-50 and MT-32 set the blueprint for the deluge of ROMplers that would soon overtake the shops. From a marketing standpoint, the ROMpler was nothing short of brilliant. After all, early sample-based synths were limited to whatever sounds were contained within, meaning that users - who were, by and large, content to call up presets - would eventually tire of the included sounds, or demand better quality. Roland was happy to oblige with a steady stream of new and improved models. To be fair, the company really did make improvements. Each year's model sported more ROM, more sounds, more patches, more programmability, and better effects. By the time of the JV-1080's release in 1994, one could expect CD-quality samples and multi-megabyte memory. In fact, the JV-1080, which was priced at £1,085, included a whopping 640 patches across 8MB of sounds, expandable to a full 42MB of samples via optional slot-in cards. The 2U rack-mountable JV-1080 offered quite a bit more than mere sample playback. Each voice consisted of a sample-based oscillator, dual LFOs, and multimode resonant filter. Patches could be sweetened with the obligatory reverb and chorus effects, alongside any of the 40(!) onboard insert effects. These included pitch-shifter, ring modulator, phaser, tempo delay, rotary speaker, and many more. With 64-voice polyphony and 16-part multitimbral operation, the JV-1080 became a fast favourite among soundtrack composers, thanks in no small part to the many excellent presets devised by future Spectrasonics mainman Eric Persing. With so many excellent sounds available and a vast and flexible synthesis architecture under the hood, it's no surprise that the JV-1080 was a success. Though Roland released a number of successors, it remained in its catalogue for an astonishing six years. Today, secondhand JV-1080s are readily available and for very little money (between £125 and £185). However, the current fad for all-things ‘80s will inevitably give way to a fascination with the ‘90s, so we wouldn’t be surprised to see prices on the rise. Readers who prefer their sounds in virtual form can take advantage of Roland's own recent recreation, or look into the many available software ROMplers from companies like IK Multimedia or the aforementioned Spectrasonics. Included among the ever-growing list of plugins available to subscribers of Roland's Cloud service, the virtual incarnation of the 1080 has been beefed up from its original spec with more samples, more voices, more effects, more reverb and chorus algorithms, and more filters. It boasts a new step LFO and new Matrix Control functions. As is the case with a great many of Roland's classic synths, much of what made the JV-1080 such a success must be credited to the not inconsiderable patching prowess of Eric Persing. Persing's company, Spectrasonics, has developed a number of powerful virtual instruments packed with samples and patches of the highest calibre. Omnisphere is the king of the heap, with a staggering 14,000+ sounds and flexible architecture. SampleTank was among the first attempts to present the power and flexibility of the hardware ROMpler as a native software instrument. The free version of SampleTank is an excellent way to get a collection of quality sounds without spending a dime, and you can add more as your needs grow and budget allows.